The QuickBooks 2012 Report window typically provides eight different buttons: Modify Report, Memorize, Print, Email, Export, Hide Header, Collapse, and Refresh. You can find out what these command buttons do by experimentation. The Modify Report button displays the Modify Report dialog box. You use this command button to customize a report. The Memorize button displays the Memorize Report dialog box. The Memorize Report dialog box lets you memorize, or permanently save, a particular set of report creation settings. After you memorize these settings, you can later produce the exact same report by choosing the memorized report from the Reports→Memorized Reports submenu. You can save a memorized report in the Memorized Report Group and also in a memorized report group. To do this, select the Save in Memorized Report Group check box. Then use the Save in Memorized Report Group drop-down list to select the report group in which the memorized report should be saved. The Print command button enables you to print the report. 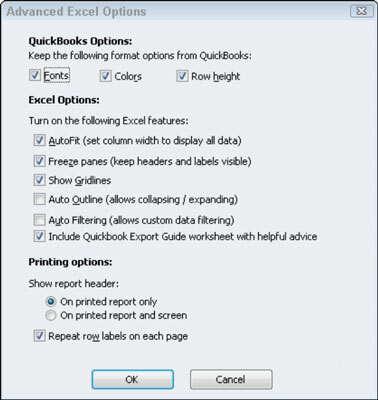 When you click Print, QuickBooks (sometimes after a bit of annoyance) displays the Print Reports dialog box. 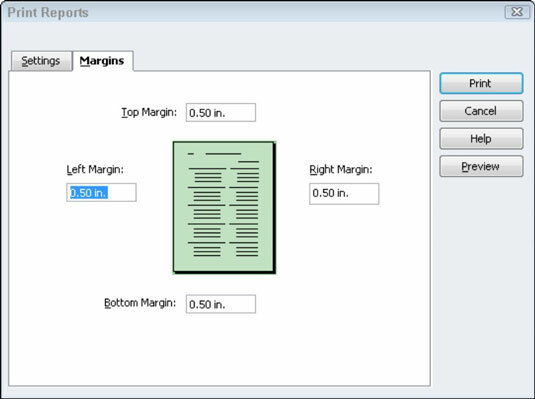 The Print Reports dialog box lets you choose how the report should print and where it should print. 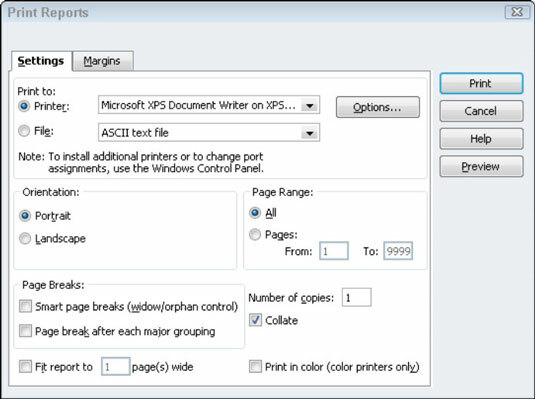 For example, the Settings tab lets you choose the printer, select a page orientation (either portrait or landscape), specify that you only want to print a range of the report’s pages, and control page breaking. The Margins tab of the Print Reports menu lets you specify the margins that QuickBooks should use on the printed report pages. You specify the top, right, bottom, and left margins in inches. Click the Preview button, provided on the Print Reports dialog box, to display the Preview window. The Preview window shows what your printed report pages look like. The Preview window also includes buttons to page to the previous and next pages of the report, to zoom in and out on the report, and to print the report to paper. After you’ve used the Settings tab and the Margins tab to specify how QuickBooks should print a report, click Print. QuickBooks sends the report to your printer. The Email command button lets you e-mail a copy of the report as an attachment. When you click Email, QuickBooks starts your e-mail program for you. If you click the Excel button, QuickBooks displays the Send Report to Excel dialog box. The Send Report to Excel dialog box lets you take the information in a report and copy it to a file that a spreadsheet program, such as Microsoft Excel, can easily open. You can send the copy to a new Excel spreadsheet, to an existing Excel spreadsheet, or to a .csv (comma separated values) file, which can be opened by just about any spreadsheet or database program. 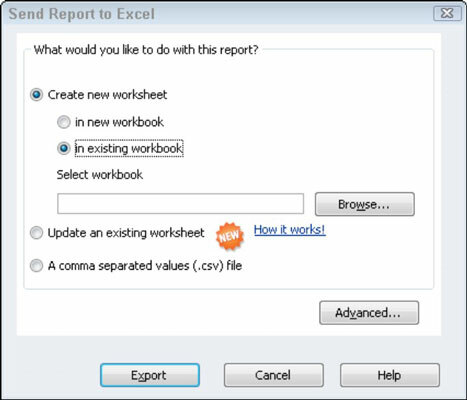 To copy the report to a new workbook, select the Create New Excel Worksheet option and then the In New Workbook option. To copy the report to a new worksheet in an existing workbook, select the Create New Excel Worksheet option, the In Existing Workbook option, and then enter the path and name of the workbook in the text box. If you want to copy the report to an existing Excel spreadsheet, select the Update An Existing Excel Worksheet option. QuickBooks then causes Excel to refresh the previously exported workbook. Finally, if you want to copy the report information to a comma-separated values file (a file format that can be opened by any spreadsheet or database program) select the Comma Separated (csv) File option. If you click the Advanced button in the Export Report dialog box, QuickBooks displays the Advanced Export Options dialog box. This dialog box allows you to control what formatting QuickBooks copies to Excel (do this with the Formatting Options check boxes), to turn on or turn off certain Excel formatting features (do this with the Excel Features check boxes), and to set up some preliminary workbook printing information in Excel (do this with the Printing Options radio buttons). This stuff all relates to how Excel works. If you’re comfortable working with Excel, go ahead and make the changes that you want. If you aren’t comfortable working with Excel, go ahead and accept QuickBooks’s default suggestions. You can change all this stuff later, rather easily, in Excel. The Hide Header button and the Collapse button change the way the report appears in the Report window and, if printed, on the page. You click the Hide Header button to remove the header information, such as the company name. If you hide the header, you can click the Hide Header button again to replace the header. The Collapse button collapses detail on a report. QuickBooks doesn’t show subaccounts on a collapsed report — only accounts. To uncollapse a report that you previously collapsed, click the Expand button. QuickBooks replaces the Collapse button with the Expand button when the Report window shows a collapsed report. The Refresh button tells QuickBooks to update a report’s information for changes in the QuickBooks data file. This sounds crazy at first, but you can actually leave report windows open. This means that a report window may show a profit and loss statement, for example, from a week ago. If you’ve entered several transactions in the last week, the report data may no longer be correct. By clicking the Refresh button, QuickBooks knows it should update the report for the most recent changes.